Frugal Mom and Wife: Free 4 Pack of Rayovac Alkaline Batteries! First 1,000 on 2/22! 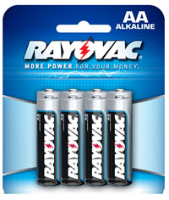 Free 4 Pack of Rayovac Alkaline Batteries! First 1,000 on 2/22! Simply head on over to their Facebook page and "like" them if you haven't already. for the first 1,000 people to request will get a Free 4 pack of batteries. Keep an eye on your FB newsfeed and their page if you want to score this freebie.